Srinagar, Oct 22: Despite tense situation following a strike called by separatists on Monday against Kulgam killings, the Karvan-e-Aman bus, operating between Srinagar and Muzaffarabad, capital of Pakistan- occupied-Kashmir (PoK), left here for Aman post, the last Indian military post on this side of the Line of Control (LoC) in Uri sector, official sources said. The bus left Bemina, Srinagar, this morning with 16 PoK returnees and three Kashmiris crossing over to other side of the LoC to meet their relatives separated in the 1947 partition, sources told TNN. They said more passengers will board the bus at Trade Facilitation Centre (TFC), at Uri before leaving for Aman post. Exact number of passengers travelling to other side will be known in the afternoon. Similarly, guests coming from PoK will be known in the evening. The Joint Resistance Leadership (JRL) has called for a general strike today which was supported by several others, including a Kashmiri pandit organization, against the Kulgam killings. Three Jaish-e-Mohammad (JeM) militants were killed in an encounter by security forces at village Laroo in Kulgam on Sunday. However, immediately after the encounter, a large number of people gathered there during which a blast took place leaving six dead and scores injured. The cross-LoC bus, one of the major Confidence Building Measure (CBM) taken by India and Pakistan in 2005, has helped thousands of families divided due to partition to meet each other and undertake the travel on “ Travel Permits” instead of International Passports. 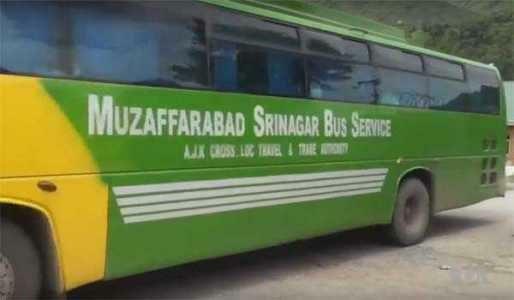 However, only state subjects from both sides are allowed to travel in the bus after their names are cleared by the intelligence agencies of India and Pakistan.